In a medium saucepan, add quinoa and water. Bring to a boil; reduce heat to low, cover, and cook for 13 to 15 minutes, until the quinoa is fluffy. Keep the heat on low. Add coconut milk, non-dairy milk, sweetener (chopped dates or maple syrup), cinnamon, vanilla, and salt. Stir to combine. Cook until the quinoa has absorbed most of the milk, but it is still pourable. Add more non-dairy milk, if needed. 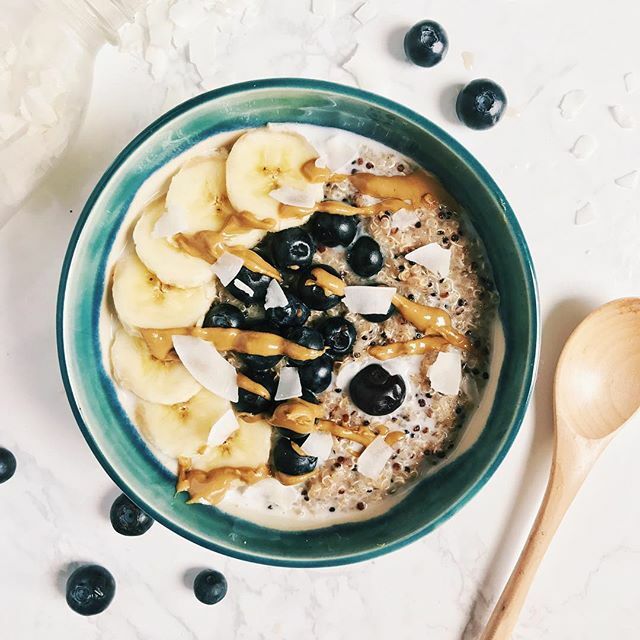 Pour quinoa into 4 bowls and top with more non-dairy milk, SunButter, plus any additional toppings you want – fruit, seeds. . . the possibilities are endless! You can make a batch of this and divide it equally between 3 to 4 jars or containers to have for easy breakfasts! * Please ensure all ingredients are processed in a facility that is free from the top 8 food allergens. Coconuts are a fruit but considered a nut by the USFDA. LEARN MORE about coconut allergies.